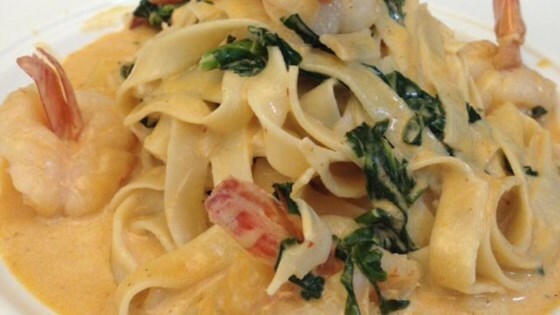 "Spaghetti or linguine with prawns and spinach tossed in a creamy chipotle tequila sauce. A fantastic Mexican dish that's dinner party worthy!" Bring a large pot of lightly salted water to a boil. Cook spaghetti in the boiling water, stirring occasionally, until tender yet firm to the bite, about 12 minutes. Drain. Heat olive oil in a pan over medium heat. Add prawns and garlic; saute until prawns are opaque, about 2 to 3 minutes. Reduce heat to low; add tequila and spinach. Cook until alcohol evaporates, about 3 minutes. Combine cream, chipotles in adobo, and salt in a blender; blend until smooth. Pour over prawns, stir, and simmer over low heat until everything is well heated (do not boil), about 3 minutes. Toss pasta in the sauce until well combined and serve immediately with freshly ground pepper and Parmesan cheese. Delicious, super-easy seafood & pasta! You can also use linguine or other pasta for this dish.